Located at the upper south gallery on the eastern wall, the mosaic is dating back to 11th century. Jesus Christ is sitting on a throne decorated with jewels. He is wearing a dark blue robe, blessing with his right hand, and holding the bible with his left hand. On his left stands Empress Zoe, offering a scroll that symbolizes the donations she made to the church. The face of her consort is believed to have changed three times according to her two previous husbands. Now is the face of her final spouse Constantine IX Monomachus. They are both in their formal dresses. Emperor Constantine IX is offering a purse, a symbol for his donation to the church. 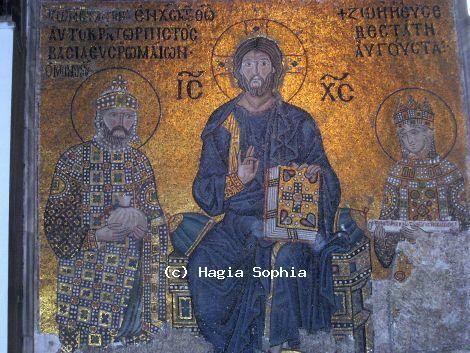 On the text below him is written “Constantine, pious emperor in Christ the God, king of the Romans, Monomachus” and the text above the head of the empress says “Zoë, the very pious Augusta”.